This is an Asian pickled. This pickle is pretty common in Asian cuisine. Most countries have their own version but cooking method is similar, 1:1 ratio of white vinegar:sugar. It can be served as a Korean banchan too. I tried to use less sugar and the result was less satisfactory as it leans toward sourish. This is great as an appetizer as the vinegar really increases your appetite. Not to say vinegar is good for us too. It said to control high blood pressure, improving digestive system, reduce urinary tract infections and diseases, strengthening bone, etc. You can do a search on the Web to read more benefits of vinegar. With this pickle, I finally found a delicious way to have a little vinegar everyday. Not to say cucumber, radish and carrot are good for us too. But got to warm you though, this has quite a lot of sugar in it, so if you are watching your sugar intake, be aware. Also, eat in moderation, a little bit in a day, not the whole thing in a day no matter how tempting it is. 1. Add the cut radish in a bowl, sprinkle with some kosher salt and let it sweat. Add the sliced cucumber in another bowl, sprinkle with some kosher salt and let it sweat too. At least 30 minutes each. Then, strain and squeeze it dry. This step ensure crunchy cucumber and radish. 2. Add the radish, cucumber and carrot in a glass jar or glass container (I used Glasslock), mix well. 3. In a small saucepan, add the vinegar mixture and let it boil in medium heat. Stirring to dissolve the sugar. Once it boil, take it off immediately and pour into the radish, cucumber and carrot mixture. Cover and let it mature at room temperature for 1-2 days. Then keep it refrigerated indefinitely (it won't last that long anyway!). Note: You can reuse the vinegar mixture for the next batch, just reheat it and pour into the radish, cucumber mixture as mentioned in step 3. Classic way to whet the appetite! I like to serve this pickle when I cooked braised pork or etc , but mine version is simple as just put all ingredients together for few hour before dinner time. Your way look more pro and it can keep for longer time. I am all in for pickles, it works as an appetite booster for me. A small serving of this prickles works good as a side with the rest prepared for the day and what more, enjoyed with rice. I remember when I was younger, I would eat this condiment before food was served in Chinese restaurants. Great! I shall try making this maybe when the weather turns warmer. 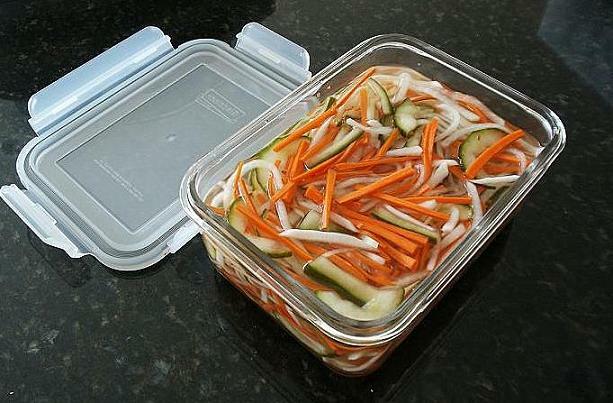 I love pickled vegetables for their crunchiness and sour taste, really good appetite booster. I love this pickles...so tasty and crunchy. hehehe!! Korean pickles!! I love it but not Mishu! whenever she see Korean food she run away!! Yes, really good appetite booster, noobcook. Hahaha, your Mishu is so cute! Luckily both my girls loved Korean food, they even eat the banchan served at the Korean restaurant. oh myyy i love pickles! in indo, we eat almost everything with pickles.